Weapons of Mass Destruction on Parliament Hill? Not so much ... 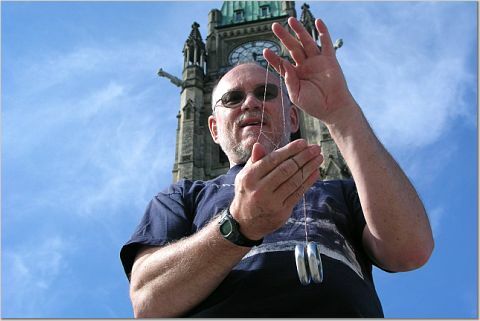 But on Monday September 11th, the 5th anniversary of 9/11, our Conservative Government once again showed its idiocy when Master Yo-Yo Expert Bill Hook was briefly detained by parliamentary Security forces in charge of allowing access to parliament hill. The reason? His WMD ... and of course by WMD we mean Yo-Yo. Now on some levels we can understand why they may have taken his wife's nail scissors and file ... lord knows we'd hate to see Prime Minisiter Stephen Harper in a pedicure against his will, but a Yo-Yo? Upon leaving the tour while retrieving his prized Yo-Yo the security official had no definitive answer as to why they'd prevent yo-yo's from entering the house of commons. Perhaps its due to a limit of 308 Yo-Yo's in parliament at one time ... and one more would upset the balance of power. Parliamentary representative Heather Bradley from the office of the Speaker of the House was quoted as saying "Security is directed to confiscate and disallow any objects which could pose a threat to the house of parliament". Oddly enough they let through numerous lighters, tubes of hand cream, strollers, screaming babies, cameras, and even packages of cigarette rolling papers, but in the face of terrorism we must watch out for Yo-yo's. Apparently they can be used with deadly precision, Just ask Bill who's known amongst South East Saskatchewan as the Yo-Yo Man.